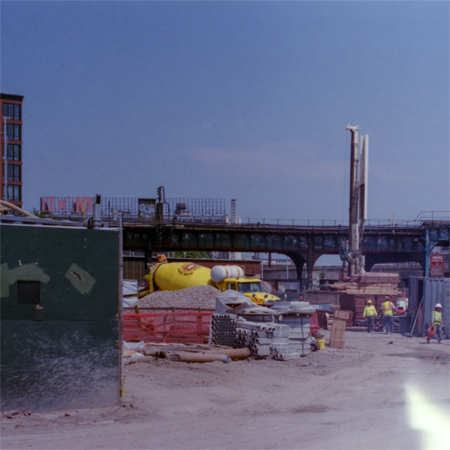 During the spring of 2016 I began working on a collaborative installation based on various construction sites in Long Island City within walking distance from my home. I sought out construction sites that were pouring concrete and asked if I could gather a bucket of wet concrete to pour into make-shift forms at the edge of the construction site. The form-works were made out of materials in the immediate surroundings: a plastic bag, a stone, the wooden barrier, the curb, a light post. Each site that I cast concrete forms from has been photographed and mapped out–photographs that correspond with the concrete casts are placed in relation to them. In related projects I began taking soil from building sites to make rammed earth sculpture corresponding to the windows at the construction sites.